I've thrown together a lot of tomato salads in my life. A lot. But, I don't think I've ever posted one here. I suppose they just seemed like a lot of the other tomato salads out there...But(!) I made a tomato salad over the weekend that is a bit offbeat, in a good way. And I thought it was worth sharing. I think the magic happened when I decided to roast half of the tomatoes. 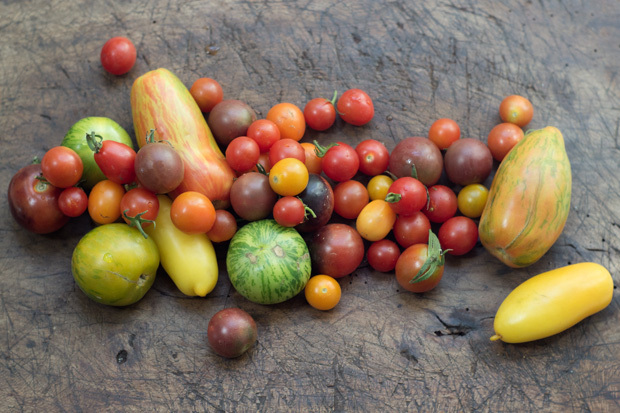 The salad became a mix of beautiful heirlooms in shades of greens, reds, yellows, and orange, tossed with their roasted, caramelized counterparts. 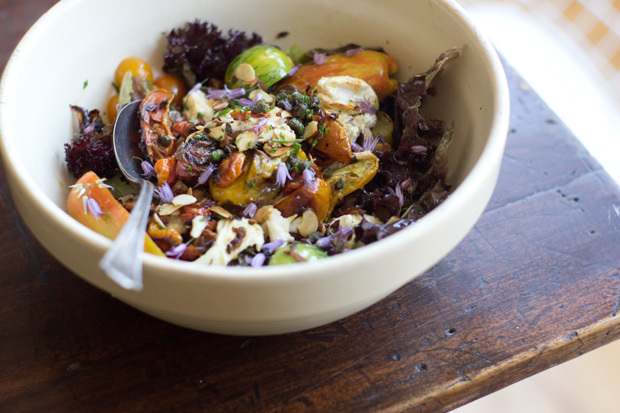 The roasted tomatoes brought depth to the salad well worth the bit of extra time and effort. Beyond that, I found myself pulling from ingredients around the kitchen. Capers, quickly pan-fried, added a mustardy pop. Crunch came from toasted almonds, and creamy fresh mozzarella delivered just the right amount of decadence. Beyond that, fresh herbs added a bright finishing accent. But don't let my version influence you too much. You can take the basic premise (a tomato salad made with a mix of ripe and roasted in-season tomatoes) in unlimited different directions. Try different nuts, herbs, and vinaigrettes. It's easy to prep nearly everything ahead of time here, and I have to tell you, this salad served on slabs of garlic-rubbed bread? Best lunch I had all week. HS: You can absolutely roast the tomatoes ahead of time if needed. Keep them in a jar covered in oil. Drain before continuing with the recipe. To start, you're going to roast about 1/2 of the tomatoes - as I mention up above, preferably a mix of cherry and heirlooms. Preheat the oven to 350°F (175°C), and adjust the oven rack to the top third of the oven. 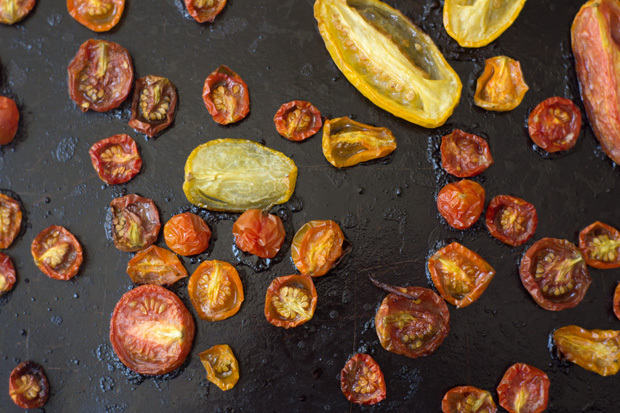 Toss the tomatoes you will be roasting gently (but well) in a bowl along with the olive oil, sugar, and salt. Arrange them in a single layer, cut side up, on a rimmed baking sheet. Bake, without stirring, until the tomatoes shrink a bit and start to caramelize around the edges, 45 to 60 minutes. Set aside to cool. When ready to serve, gently toss the roasted and raw tomatoes with a bit of chive or lemon oil, most of the almonds, the capers, the mozzarella, and the lettuce. Taste and season with a bit more salt if needed. Serve topped with the remaining almonds, and any herb flowers you might have. Serves 4 - 6 as a side. *To make chive oil, use a food processor to puree 1/4 cup chopped chives with 1/2 cup / 120 ml good olive oil. Stir in another 1/4 cup finely chopped chives by hand. Season with sea salt to taste.